FCFA is training African scientists in new skills and methodologies to study the African climate. 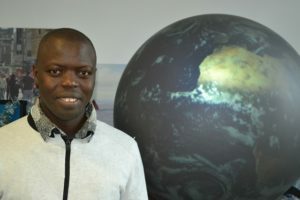 Youssouph Sane participated in a week-long workshop on climate modelling at the University of Leeds, organised by the Africa Monsoon Multidisciplinary Analysis 2050 (AMMA-2050) project in December 2016. Youssouph Sane spends much of his working life thinking about the west African monsoon. He is involved in many aspects of the AMMA-2050 project, which is assessing the causes and consequences of changes in the monsoon as a part of the FCFA programme. In December, Dr Sane took part in a training workshop organised by the project to skill up on Python, a computer programming language used to analyse various climate models. He and his colleagues also got access to the CMIP5 ensemble of climate models. He will have many immediate opportunities to apply the new skills and knowledge to the AMMA-2050 project, he said: in the first instance, he’ll use Python in modelling the physical dynamics of the west African monsoon. Then, he’ll analyse how the monsoon’s changes are affecting west African lives and livelihoods. Last and most importantly, he and his colleagues will face the challenge of convincing decision-makers to use the new climate information in development policies and programmes. Dr Sane has a key position in the AMMA-2050 research project because he is Head of Climate Projections at ANACIM, Senegal’s National Civil Aviation Agency (Agence Nationale de l’Aviation Civile et de la Météorologie). Long dedicated to environmental causes, Dr Sane said he felt he could make the greatest positive difference to his country’s future by choosing a career in climate sciences, and helping grassroots producers to adapt to the changing conditions. “We tell farmers what we observe scientifically and we share our forecast. After that, we do a field test in the villages: conventional farming methods alongside new climate-adapted methods. We compare the results in the two fields at the end of the season.” This practical, hands-on demonstration is the only way to convince farmers to evolve their approach in sync with the changing climate, according to Dr Sane. Whereas much of this work is focused on farmers’ immediate, short-term needs, the research for the AMMA-2050 project will look at longer-term climate projections and what they mean for planning in the agriculture sector. “We will look at climate observations to see the trend for slow onset climate changes and for extreme events. From the historic record, we will look at the indicators for these events. Then we will look for these indicators in the future climate projections” to see what trends lie ahead, he said. The computer programming language that Dr Sane and his FCFA-supported colleagues have been learning in Leeds will be a “good tool to use for any metrics”, he said. Not only will it be useful for his many AMMA-2050 project tasks but also for future work. This information should be highly relevant for decision-makers in relevant government ministries, such as agriculture and water resources. However, one of his biggest challenges down the road – he added – would be to ensure that the information is not only used by his ‘home’ ministry, the Ministry of Tourism, but by all the government ministries and departments that could benefit, including water and agriculture.